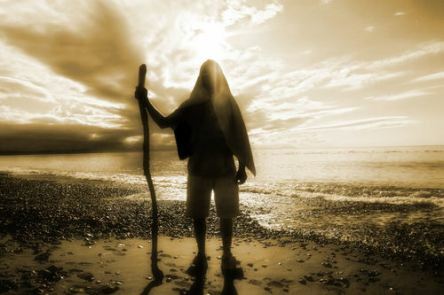 Genesis 5 — Enoch walked faithfully with God; then he was no more, because God took him away. When God created mankind, he made them in the likeness of God. He created them male and female and blessed them. And he named them “Adam” when they were created. When Methuselah had lived 187 years, he became the father of Lamech. After he became the father of Lamech, Methuselah lived 782 years and had other sons and daughters. Altogether, Methuselah lived a total of 969 years, and then he died. When Lamech had lived 182 years, he had a son. He named him Noah and said, “He will comfort us in the labor and painful toil of our hands caused by the ground the LORD has cursed.” After Noah was born, Lamech lived 595 years and had other sons and daughters. Altogether, Lamech lived a total of 777 years, and then he died. God’s word continues to blow me away. Take a look at the meanings of the names listed in Adam’s family line. Man (is) appointed (to be) subject to death (and) sorrowful (but) from the presence of God one comes down, dedicated and dying, He shall send to the poor and lowly rest (or) comfort. Here we are only five chapters into the Bible and already the gospel message is found! According to the principles of textual criticism, it’s impossible for these names to be here, with these meanings, in this order, and at this point in the Bible, unless the book of Genesis was written after the New Testament. Of course every Bible scholar on the planet, both Christian and non-Christian alike, agrees that Genesis was written thousands of years before the New Testament. What does it mean then? It means that God knew Adam would blow it. God knew that mankind would need a savior. It means that God, in His abundant grace and mercy, provided a way to reconcile you and I to Him. And He was preparing the world through His word thousands of years before He sent His Son! Finally, it means that the Bible is the genuine word of God! As I read through Adam’s family line and about Enoch specifically, it occurs to me that on that day, that day we’ll all face, that day when we’re before the Lord at the Judgement Throne, one of the most important things in the universe will be the heritage you and I left behind. (Hebrews 9:27) What do you want to say to the Lord about your family on that day? What are you doing today to shape and grow your family toward becoming the people you want to tell the Lord about on that day? Think about it. Will the size of your salary be more important on that day? Will your wardrobe be more important on that day? Will your video game achievements be more important on that day? Every one of these will be hay and stubble on that day (1 Corinthians 3:12-13) It’s been said that wisdom can be defined as doing something now, that you would have wished you had done five years from now. Why not live the rest of your life doing now what you would have wished you had done on that day? On that day, nothing will be more important than hearing those words, “Well done good and faithful servant.” (Matthew 25:23) Everything about your life, and mine too, should point toward preparing for that moment when we’re held accountable before the Lord. Enoch’s testimony is what I long for, for my family. My prayer for you is that you do too. …he had this testimony, that he pleased God. This entry was posted in Bible Commentary, Bible Study, Genesis, Marriage and tagged Christian, Christian living, Enoch walked faithfully with God then he was no more because God took him away, Genesis 5 24, Genesis 5 names, Jesus by Kurt Bennett. Bookmark the permalink.